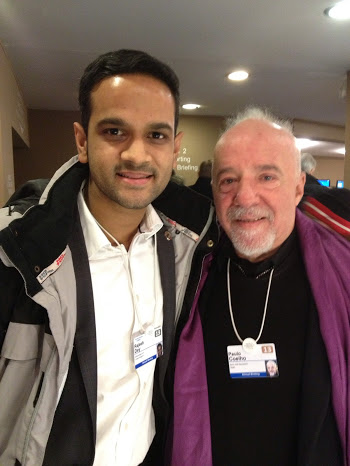 As the world starts to bubble with Rajeeb Dey’s #unrecruitment revolution – official WEF blog here – you’d be forgiven for thinking he couldn’t possibly have time for another Davos Diary. ESPECIALLY considering he’s going to be on France 24 tomorrow at 16:10, debating the issues around the ‘lost generation’ of job-seekers (which you can stream here). Well, you’d be wrong. Very wrong. Last night marked a flurry of evening receptions and parties, with so much to choose from you certainly need to be both “dynamic” and “resilient” (the two Davos 2013 buzzwords I’m sure you’re all well versed on) to survive the tidal wave of merriment. I have perfected the art of event hopping (which is a basic survival skill here at Davos), managing to cover the China European Business School Reception,Mahindra party, Zurich Insurance YGL nightcap and PepsiCo YGL nightcap all in one evening. A 9am start greeted me – beginning with round table discussion on creating a “new vision for Arab Employment”. The Arab region faces a number of complex challenges around youth unemployment: there’s currently a strong reliance on the Public Sector for avenues into employment, with the majority of Emiratis citing the government as their first choice of employer. It seems that public salaries are much higher than the average due to ‘reservation wages’, and the work style is notoriously laid-back – so in many ways you can’t really blame them! The challenge here is to change the attitudes of the local youth; to start getting them excited about the idea of entrepreneurship as a career path, about SME’s and working in the private sector. If we want to avoid another Arab Spring situation, action must be taken fast. After a stimulating discussion on Arab culture, education and employment challenges it was time to move on to a brainstorming session with Craig Mundie – CTO of Microsoft. Craig is a Microsoft veteran (he’s worked there for 20 years) and technology guru, personally appointed by Bill Gates. With some other of the other Young Global Leaders, we brainstormed topics around the future of education – a field that is currently experiencing a great amount of disruption. We have all the ingredients to enable mass and open access to education thanks to lower costs of technology, the movement with “MOOCs” (massive online open courses) and greater connectivity. It’s a very exciting time to be involved in this area, and I look forward to some amazing innovations in the coming years. author of such amazing books as The Alchemist and The Manual of the Warrior Of Light, and famed for the openness to which he approaches putting his texts online. He’s a true inspiration, and it was an honour to meet him. Next, it was time to facilitate a discussion around Talent Mobility. My group was focused on the topic of how we could create a “badge system for skills” – the premise being that if there was a way of validating the skills of a nurse in Mexico he/she could work freely in other countries rather than the problem faced today – where we restrict the mobility of skilled workers through imposing local controls/exams. Given the global mismatch of skills the mobility of talent is something governments and businesses need to address if they are serious about growth and reducing unemployment. I was delighted to be joined in my group by prolific tech entrepreneur Esther Dyson; leading angel investor and truly inspiring philanthropist. Still to come today – an interview with the World Economic Forum, dinner with William Reese (CEO of the International Youth Foundation) and a whole series of receptions, including the DLD Party, FTI Consultancy night cap and an India/Africa event! For instant updates, follow @rajdey on Twitter, and follow @enternships for all the detail.